This note tracks changes in the groundwater market between 2005 and 2015 in Amarsinghi, a village in Malda district in the State of West Bengal, India. It analyses changes in the ownership of tubewells and access to groundwater irrigation, and the cost of irrigation in agriculture that followed two major government interventions in the village, namely, electrification and the installation of a tubewell run by a cooperative. It shows how these interventions changed the terms of exchange in the existing water market in the village, and the effects they had on the cost of irrigation for farmers who purchased water for irrigation. West Bengal is located in the Gangetic alluvial region, which is rich in groundwater resources and receives an average of 1500 mm of rainfall per year. The growth rate of groundwater irrigation in the State was slow till the late 1970s. Agriculture stagnated in this period, when it reached what has been described as an “agrarian impasse” (Boyce 1987). The major cause of agricultural stagnation was stagnation in the development of irrigation. The agrarian structure of West Bengal is characterised by marginal and small farmers who operate fragmented landholdings.1 Rawal and Swaminathan (1998) have argued that the technological changes that are necessary to develop irrigation require large capital investments and involve high risk, which are major constraints for marginal and small farmers in the State. Further, inequality in the agrarian structure and the absence of institutional mechanisms to mobilise cooperation in irrigation practices posed a serious obstacle to the development of irrigation in West Bengal till the late 1970s (ibid.). The State came out of the impasse in the 1980s (Bhattacharya and Bhattacharyya 2007; Rawal and Swaminathan 1998; Rogaly et al. 1999; Saha and Swaminathan 1994), when West Bengal began to achieve high agricultural growth rates. The development of irrigation, particularly tubewell irrigation, played a key role in the growth of agricultural production in the 1980s (Rawal and Swaminathan 1998; Rawal 2001). Private investment in tubewell irrigation was a major reason for the expansion of irrigation. The expansion of tubewell irrigation also received support from the state, in the form of an expansion of the electrification of agriculture. Between 1977–78 and 1992–93, the compound annual growth rate of electrification of agricultural tubewells in West Bengal was 11.3 per cent, the second highest among 19 States in India, as compared to 7.2 per cent in the country as a whole (Rawal 2001). As a result, a remarkable increase in irrigated area took place after the mid-1970s. Table 1 shows the increase in area irrigated by different sources of irrigation between 1975 and 2011. It is clear from the table that there were distinct phases in the expansion of irrigation in West Bengal. Between 1975 and 1985, the State showed a growth of 7.4 per cent in annual net irrigated area as a whole, and the expansion in tubewell irrigation was highest among all the sources, at 57.5 per cent. However, after the mid-1990s, the expansion of irrigation and, in particular, tubewell irrigation, slowed down. Source: For 1975–85, cited in Rawal and Swaminathan 1998; All-India Report on Agriculture Census, Government of India 1992, 1998, 2003, 2008, 2012, 2015. After the mid-1990s, there was a deceleration in agricultural growth in the State (Ramachandran, Swaminathan, and Bakshi 2010). One reason for the slowdown was the rising costs of irrigation because of high diesel prices, which in turn led to a decline in summer (boro) paddy cultivation (Bakshi 2010). Mukherji et al. (2012) have argued that high diesel costs, slow rates of tubewell electrification, and bureaucratic hurdles in getting permission for tubewell installation were responsible for a decline in the rate of growth of tubewell irrigation in West Bengal after the 1990s. The agrarian structure of the State, characterised by a predominance of small farms and extreme fragmentation of land, led to the development of informal groundwater markets. The market for water is highly segmented, with a small number of wealthy farmers owning tubewells and selling water to a large number of poor farmers. There are many debates around water markets, particularly relating to the effects of such markets on water buyers who are small farmers or relatively poor households. Some scholars have argued that private water markets provide access to irrigation for small and marginal farmers, and thus promote equity in access to groundwater irrigation (Shah 1991). It has also been argued that a competitive groundwater market is associated with better utilisation of groundwater and can act as an incentive in checking irrigation costs (Shah 1991; Shah and Ballabh 1997; Mukherji 2007). Others have argued that water markets lead to exploitative relationships between tubewell owners and water buyers (Janakarajan 1993) and accentuate rural inequalities (Bhatia 1992; Dubash 2002; Rawal 2002; Sarkar 2011). How has the shift from diesel-powered tubewell irrigation to electrified tubewell irrigation and the installation of a cooperatively managed deep tubewell affected the pattern of ownership of wells, the terms of exchange between water sellers and buyers, and water prices? What are the differences in cost of irrigation for buyers purchasing water from the cooperatively managed tubewell and from the private water market? The village of Amarsinghi is situated in Ratua I Block in Malda district, in the New Alluvial Plains of West Bengal. The village has been surveyed several times: by a UNU–WIDER project in 1988–89, a census-type survey for a study on “Landlessness and Debt in West Bengal” sponsored by the Government of West Bengal in 2005, and a detailed sample survey by Aparajita Bakshi in 2005–06. A census survey was conducted by the Foundation for Agrarian Studies (FAS) in 2010 and a sample survey in 2015, as part of its Project on Agrarian Relations in India (PARI).2 Tapas Singh Modak undertook case studies on specific questions of irrigation development through semi-structured interviews in 2016.3 This note uses data from the 2005, 2010, and 2015 surveys, and information from the case studies of 2016. In 2010, the census-type survey enumerated 127 households (575 persons) in the village. Forty-five per cent of its population belonged to Scheduled Castes (SC), 0.7 per cent to Scheduled Tribes (ST), and the remaining were from Other Backward Classes (OBCs). Land holdings in the village were small: the average size of operational holdings was only 0.8 acre. Among the cultivator households, 66 per cent owned operational holdings whose extent was less than 1 acre, 30 per cent operated holdings of 1 to 2.5 acres, and the remaining 3 per cent operated holdings that were more than 2.5 acres in area. About 30 per cent of all households in the village were landless, 67 per cent were marginal farmers, and the remaining 3 per cent were small farmers. The main crops were kharif or monsoon (aman) rice, winter (boro) rice, and jute. Potato, mustard, and pulses (lentils and gram) were also grown (Table 2). While the cultivation of boro paddy and potato was entirely irrigated, supplementary irrigation was used for the other crops. Different kinds of vegetables were also grown, although the acreage under these was very small. Source: PARI survey data, 2010. The development of irrigation in the village, as in much of the State, was minimal until the mid-1970s. Modern and mechanical irrigation was introduced in Amarsinghi with the establishment of a public river lift irrigation (RLI) scheme in the late 1970s. However, the scheme did not fall within the village boundaries, and only some crop land belonging to cultivators in Amarsinghi was irrigated by water from the RLI scheme. Nevertheless, this public intervention and its contribution to a secure irrigation supply introduced boro rice cultivation in the village. In the early 1980s, farmers began to install self-operated, diesel-powered shallow tubewells (known as mini-tubewells). The geographical location of the village,4 abundant groundwater, low diesel price, and support from the gram panchayat played a favourable role in the expansion of shallow tubewell irrigation, both in terms of the number of tubewells and area irrigated.5 Private shallow tubewells and the RLI scheme increased the extent of boro cultivation in the village, and resulted in a change from mono-cropping to multiple-cropping. Electricity for irrigation came to the village in 2007. Shallow tubewell owners gradually shifted to electric-powered submersible tubewells. There is no longer any diesel-powered shallow tubewell in the village. A deep tubewell was installed in 2008 by the Government of West Bengal. It is managed by a cooperative group. Source: Ministry of Petroleum and Natural Gas, Government of India. While there were two sources of irrigation in Amarsinghi in 2016 – tubewell irrigation and river lift irrigation (RLI) – the primary sources were private shallow tubewells and a public deep tubewell. 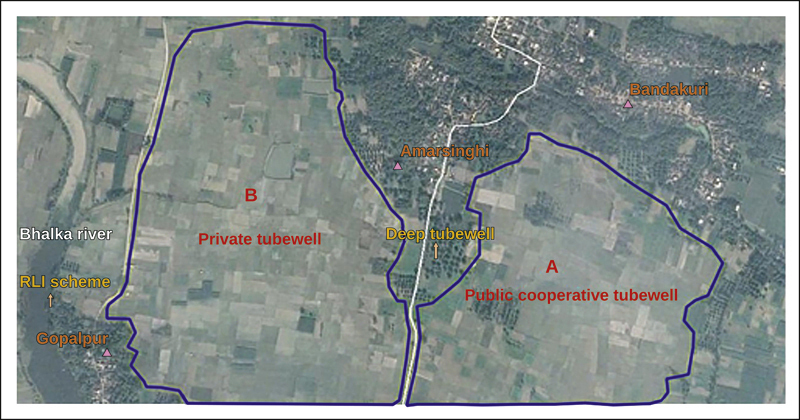 In the village map (Figure 2), A and B represent the command area of the public, cooperative-run tubewell and private tubewells, respectively. The crop area irrigated by the two types of tubewells is clearly distinguished by the main village road. Crop land on the eastern side of the main road was irrigated by the cooperative-run tubewell, and crop land on the western side was irrigated by private tubewells. The RLI scheme is located on the Bhalka river, a tributary of the Ganga in Gopalpur village (adjoining Amarsinghi), to the west of the private tubewell-dominated area. The extent of irrigated land under the RLI scheme is very limited at present, and water from the scheme is used as supplementary irrigation by cultivators in Amarsinghi. Source: Google maps, accessed on April 18, 2017. Most of the cultivated land in Amarsinghi is irrigated. In 2005–6, according to the sample-based estimate, 88.6 per cent of the gross cropped area was irrigated. In 2010, the figure recorded in the census-type survey was 89.7 per cent. In 2005, 82 per cent of the total irrigated area was irrigated by diesel-powered shallow tubewells, and the remaining area by government-owned river lift irrigation (Bakshi 2010). By 2010, the share of tubewell irrigation had increased to 90.3 per cent of the total irrigated area (Table 3). Source: For 2005, Bakshi (2010); for 2010, PARI survey data, 2010. Village survey data show that a majority of cultivators bought water for irrigation. In 2010, 82 of the 90 households that operated land in Amarsinghi bought water, and 83 per cent of the gross irrigated area was irrigated by means of purchased water. Tubewell irrigation was the predominant source of irrigation. Thirty-nine per cent of households purchased water from the cooperative-run tubewell and 62 per cent from private water sellers in 2010 (Table 4). Note: *Farmers purchased water from multiple sources as crop lands were distributed across the command area of irrigation sources. In the 1980s and 1990s, all tubewells were diesel-operated. After the electrification of irrigation in 2007, only a few tubewell owners were able to shift from diesel tubewells to electric-powered tubewells using submersibles. Though the potential command area of an electric tubewell with a submersible is much higher than that of a diesel-powered tubewell, the high capital cost of installation and the process of getting permission for electric tubewells made shifting from diesel to electric-powered tubewells difficult and expensive for tubewell owners.8 One respondent told us that the command area of an electric-powered submersible was about 25 acres of land, while it was only six to seven acres for a diesel-powered shallow tubewell. The shift from diesel-powered to electric-powered tubewell irrigation led to significant changes in ownership, water use, prices, and exchange relations in the private water market. In 2005, there were 10 tubewells in Amarsinghi, owned individually or jointly, and all the tubewells used diesel pumps. In 2010, the number of tubewells fell to six. Of these, four tubewells were powered by diesel pumps and only two shifted to electric-powered submersible tubewells. Two tubewells (one diesel pump9 and one electric submersible) were jointly owned, each by two households (Table 5). All six tubewell owners in 2010 reported having sold water. Tubewell owners sold water for a much larger area to be irrigated than they themselves irrigated. In 2015, there were only four tubewells in the village, all of which used electric submersible pumps, and no diesel tubewell. The richest household owned two tubewells; of the remaining two, one was owned jointly by two households. The data show a clear fall in the number of tubewells between 2005 and 2015, reflecting a tendency towards concentration of ownership and control over water sources. We elaborate with a case study of BM, the largest landowner in Amarsinghi. BM had an operational holding of 4.5 acres in 2015. In terms of net household income, his household was one of the richest households in the village, in 2010. His income was solely from agriculture and the sale of water. Selling water became his major source of income in 2015. His tubewells irrigated about 67 acres of crop land, including crop land in Amarsinghi and surrounding villages. In 2015, he earned Rs 2.5 lakh as net income from the sale of water. His total income was Rs 3.8 lakh. BM installed electric submersible tubewells in 2010 and 2014. For the installation of both tubewells, he received a loan from the United Bank of India, Samsi branch. However, he installed the second tubewell in 2014 within the existing command area of another individual’s submersible tubewell. A uniform water rate for each crop had been decided by all the tubewell owners under the Samsi gram panchayat.10 BM ignored this informal agreement and reduced the water rate in order to increase the command area of his second tubewell. As a result, the area irrigated by the other tubewell was reduced to only five to seven acres of crop land, whereas the capacity of an electric submersible tubewell is about 25 acres. The other tubewell owner, a marginal farmer, was unable to compete with BM in reducing the water rate, and he failed to recover his investment in the tubewell. Though the literature on water markets often advocates competition to drive down water rates, in this case we see that BM, being wealthier than his competitor, was able to drive him away through predatory pricing. Though at present BM has reduced the water rate for water buyers, he will surely increase the water rates once the loss-making tubewell owner exits. In the 1980s, when water first began to be sold, it was purchased on time-rated contracts, for all crops; that is, payment was made for the number of hours a cultivator received water. An interview with AM revealed that the total irrigation cost was very high under time-rated contracts, particularly for water-intensive boro rice, which required water frequently during cultivation. Later there was a shift to share contracts and then, by 2016, to fixed contracts. In Amarsinghi, boro rice was irrigated by shallow tubewells and diesel pumps. Rent for water was high and households paid one-fifth to one-sixth share of total produce as rent. In addition, households had to meet all expenses for diesel. Irrigation costs amounted to 42 per cent of the gross value of output of boro rice in Amarsinghi. Payment for water as a share of total produce provided an incentive to diesel tubewell owners selling water, who were also mainly marginal or small farmers, to provide water on a regular basis and oversee cultivation. However, after electrification and the concentration of tubewell ownership, the contract shifted to fixed rates. One explanation for this is that share contracts require maintaining many records and monitoring the cultivation of water buyers, a difficult and complex task for water sellers, who are few in number. At the time of the 2010 Project on Agrarian Relations in India (PARI) survey, all water charges were being paid at fixed rates, in cash or kind. There were two kinds of contracts: crop-acreage contracts and time-rated contracts, the former being more common. In crop-acreage contracts, water buyers usually received adequate water throughout the crop-cycle, and they were charged based on the area irrigated. The volume of water supplied or hours of irrigation were not specified. In time-rated contracts, water was purchased at hourly rates. In 2010, about 95 per cent of the area irrigated by private water sellers involved crop-acreage contracts and the remaining were time-rated contracts. Time-rated contracts were only used for aman rice, jute, and mustard cultivation, where water requirement for irrigation was low. For boro rice and rabi crops crop-acreage contracts were used, but prices were not uniform across buyers. As mentioned, payments were made in cash or kind. The form of payment depended on the timing of the payment. In cash contracts, water buyers had to pay at the beginning of the crop season, while payments in kind were made after the harvest. The rate per acre for payments in kind was about 15 per cent higher than for cash payment, and tubewell owners preferred payment in kind.11 About 90 per cent of the irrigated area in 2010 was under contracts that involved payment in kind. Water rates in the private water market varied. For example, water charges ranged from Rs 1,500 to Rs 9,581 per acre for boro rice in the private water market in 2010. The differences in rates were mainly on account of the types of tubewells used for irrigation (diesel or electric pump), terms of contract (crop-acreage or time-rated contracts), and forms of payment (cash or kind). In addition, location of the crop land,12 distance from the tubewell, and personal relationships were also key factors in determining water rates. Table 6 shows the average per acre water charge for major crops paid by water buyers in 2010 and 2015. All kind payments are valued at farm harvest prices of produce in this calculation. The shift from diesel to electric tubewells lowered water rates for all crops in 2010. The rates for buying water from diesel tubewells were higher due to high diesel prices. During the 2015 sample survey, it was seen that all payments to private water sellers had shifted to crop-acreage contracts as time rates required rigorous monitoring and account-keeping. Water buyers also preferred crop-acreage contracts as these ensured water supply throughout the crop cultivation period. Diesel pumps were no longer used for irrigation in the village, and hence no additional diesel charge was necessary. However, there was a significant increase in water rates for all major crops except jute. The shift from temporary connections to metered connections in electric tubewells had not reduced the water rate.13 Water charges for boro rice ranged between Rs 4,500 and Rs 6,000 per acre, or three to six quintals of paddy in 2015, which was higher than the charges for electric tubewells in 2010. The reason very likely is the rise in power tariffs for agriculture in West Bengal. Tubewell meters have followed a time-of-the-day (ToD) system after 2008–9, with three different rates according to the time of day.14 By assigning equal weights to the three tariff segments, the average tariff increased from Rs 3.19 per kWh in 2010–11 to Rs 4.81 per kWh in 2014–15, a hike of over 50 per cent. The increase in water rates is thus likely to be on account of the rise in power tariffs. Continued demand by farmers in Amarsinghi and surrounding villages led to the installation of a deep tubewell in the village by the Irrigation Department in 2008. A minor irrigation programme begun by the Left Front Government in West Bengal had the following conditions: the area had to be Scheduled Caste-dominated, and land had to be donated for housing the pump. The demography of Amarsinghi village and farmers’ efforts in donating land qualified it for installation of the public tubewell. It was a norm of the West Bengal government in 2008 that public tubewells were managed by cooperative committees. Accordingly, an 18-member committee was formed in 2007 with six members from Amarsinghi and the remaining from Bandakuri, a village also served by the well. A secretary, chairman, and cashier were selected in a general meeting of farmers, and the tubewell was managed by a cooperative committee. The depth of the tubewell was about 500 feet with a pump of 25 HP (horse power) capacity. The potential command area was about 100 acres. The well irrigated about 70 acres in 2016. The irrigated area in boro rice cultivation was generally greater than in other crops. About 125 small and marginal farmers received water from the deep tubewell. The command area of the tubewell was spread across two villages: Amarsinghi and Bandakuri. Water was conveyed from the cooperative tubewell to the field by means of underground PVC pipelines. The water supply was controlled from the pump house. The longest distance from the pump house of the tubewell to a buyer’s land was about a kilometer. The exchange relations in the case of the cooperative tubewell were democratic and transparent.15 The form of payment and water rates for different crops were discussed in a general meeting with water users. First, the committee decided the water rate, following which they called for a general meeting with water users. The advice of the general meeting formed a basis for negotiation, and a final decision was taken by the committee. The committee maintained accounts of water sales and costs, and the cashier and the secretary presented annual accounts at the general meeting. In the case of the cooperative tubewell, the contracts that prevailed were crop-acreage contracts paid in cash. Water rates for different crops were uniform for all water buyers. In addition, the caretaker and the secretary were paid in kind during the two cycles of rice cultivation. The caretaker was responsible for conveying water to all the plots, operating the pump, and cleaning the channels. The secretary maintained all the accounts and collected money from the buyers. In our survey data we found some variations in water rates paid by buyers, particularly those owning very small parcels of land. The water rates set by the cooperative group were at a break-even level, meant to cover only electricity charges and maintenance costs. Table 7 shows that the average rates paid by buyers in 2010 were Rs 600 and 18 kg of paddy per acre for aman rice, and Rs 1,500 and 45 kg of paddy per acre for boro rice. The cash payment increased to Rs 1,200 for aman rice and Rs 2,100 for boro rice in 2015. Payment in kind for the caretaker was the same as in 2010. Note: All payments in kind are valued at local prices in this calculation. Source: PARI survey data, 2010 and 2015. River lift irrigation was the first public intervention in agriculture in Amarsinghi and surrounding villages. About 15 cultivator households of Amarsinghi gained access to water from the river lift irrigation scheme. This section deals with the institutional issues related to a public scheme. The river lift irrigation scheme came under the jurisdiction of the Ratua 1 Block Development Officer (BDO). A seven-member committee was formed by the Block Development Officer to operate the scheme in 1980–81. The members of the committee belonged to four villages: two were from Gopalpur, two from Amarsinghi, two from Bandakuri, and one from Arshadpur. In 2016, the secretary of the committee belonged to Amarsinghi village. All operational and maintenance costs were borne by the office of the BDO. The government had built three cement pipelines that formed a 300-metre network. The depth of the main pipeline was 18 inches, and distributor pipelines were six inches deep. After the distributor pipelines, water passed through unlined channels along the borders of the fields. Water rates were low (Table 8) and fixed by the BDO. Our survey showed similar water rates for different crops. The committee was responsible for conveying water to the farmers, collecting water charges in advance of the crop season, and depositing the money at the BDO’s office. In each season, diesel was sent for the river lift irrigation scheme. Two persons were assigned by the government to operate the machine. In addition, the committee appointed two persons to oversee the distribution of water in different crop lands. Farmers had to pay 15 kg of paddy per acre to the two caretakers in each rice season. Source: Secretary of RLI, 2016. Lack of maintenance and institutional corruption posed serious threats to the scheme in 2016. The river bed was usually dry, except during the monsoon. The river was polluted by water hyacinth that clogged the irrigation system. After a bund was constructed near the scheme, water was available for only a few months and not throughout the year. The scheme was alternately operated by two diesel pumps. There was no submersible pump that could extract water from beneath the river bed during the summer crop season. Therefore, the river lift irrigation facility was limited to the monsoon. The potential command area that was created was about 100 acres of land, but utilisation was low in 2016. Though water from the RLI facility was not available in summer, participants of the scheme still paid for this facility for boro rice cultivation. Diesel sent from the BDO’s office for operating the river lift irrigation scheme was distributed by the committee among the farmers, instead of being used for irrigation. Further interviews suggested that there was corruption associated with the RLI. Although private tubewell installation is usually not permitted if there is public irrigation, there were three electric-powered submersible tubewells in the RLI command area. The electricity connections were not legal. Stealing electricity was common in the area, and happened with the knowledge of the Electricity Department. Cultivators who could not gain access to water from RLI shifted to private tubewell markets, where water rates were about seven times higher, for quality and secure irrigation during boro cultivation. A demand to shift from diesel pumps operated by the RLI to a public deep tubewell on the river bed has been made by cultivators. This proposal has been opposed by private tubewell owners, and the committee has not shown any interest in it as it will affect its income from sale of diesel. We now turn to the costs of irrigation by source of irrigation, particularly in the cultivation of boro rice and potato, which are water-intensive crops. We divide own tubewells and hired irrigation from private tubewells into two categories, based on the source of power of the tubewells, diesel oil and electricity. Table 9 shows that for the main irrigated crop, boro rice, the average irrigation cost per acre and total paid-out cost were much higher for households that purchased water from private electric and diesel-powered tubewells, than for households using the cooperative tubewell or own tubewells in 2010.16 As a result, irrigation costs constituted about 26 per cent of total paid-out costs for households dependent on private electric tubewells, and 39.3 per cent of paid-out costs for households dependent on diesel-powered tubewells. In contrast, households using the cooperative tubewell paid only 13.9 per cent of paid-out costs for irrigation. The cost of river lift irrigation was lower than that of all other sources of purchased irrigation in boro rice cultivation. For potato cultivation, the difference between the share of irrigation cost in total costs when water is purchased from the cooperative tubewell and from private water sellers is not significant. The same pattern is reflected in the ratio of irrigation cost to gross value of output (GVO). Table 10 shows that the share of irrigation cost in GVO was high for households that received water from private electric and diesel-powered tubewells, 18.6 per cent and 24.7 per cent respectively, while it was only 8.1 per cent for households that received water from the cooperative tubewell. Between 2010 and 2015 there was a decline in the share of irrigation cost in total paid-out costs for households that purchased water from the cooperative tubewell for boro rice and potato cultivation, while it remained the same for cultivators who purchased water from private tubewells (Table 11). However, for boro rice cultivation in 2015, the percentage of irrigation cost to GVO declined to 7.4 per cent for households that bought water from the cooperative tubewell, and to 15.9 per cent for households that purchased water from private tubewells. This is mainly because farmers buying water from private water sellers had a higher average yield (2,610 kg per acre) than farmers buying water from the cooperative (2,329 kg per acre) in 2015. Though we are not certain about the reason for this difference, more efficient and stricter monitoring of water use by water buyers could be one of the factors. Source: PARI survey data, 2015. In this note we have studied the dynamics of the water market in West Bengal using data spanning a decade from three surveys of Amarsinghi village. We show how two state interventions in the village – electrification and the installation of a deep tubewell by the Government – changed the ownership of tubewells, terms of exchange, and water rates in the village. It also examines the impact of these changes on the cost of irrigation. In the 1990s, secure irrigation from private shallow tubewells and a river lift irrigation scheme led to boro rice cultivation in Amarsinghi, and to a shift from mono-cropping to multiple-cropping. At the time of the first PARI survey in 2005, Amarsinghi was primarily irrigated by diesel-powered tubewells. A vibrant water market existed for exchange of water from tubewell irrigation, and the majority of cultivators bought water for irrigation. The increasing cost of diesel and declining groundwater level, particularly in the summer months, led diesel tubewell owners to abandon their tubewells or replace them with electric-powered tubewells. Electricity for agriculture came to the village in 2007, and diesel pumps were gradually replaced by electric pumps. As the installation of tubewells involved a large investment and overcoming hurdles in getting permissions for tubewell installation, only some landowners were able to install electric-powered submersible tubewells. This control over water is therefore concentrated in the hands of a few rich farmers. In 2008, a deep tubewell was installed by the Government of West Bengal, and managed cooperatively by an 18-member committee. The government did not subsidise the operating costs or the electricity tariff, though it did pay the capital cost of installation of the tubewell. The tubewell was maintained on a no-profit, no-loss basis, with charges covering operating costs. There was participation of all water users and transparency in maintaining the accounts. Another public intervention, the river lift irrigation scheme, was introduced near Amarsinghi village in the late 1970s. Only some cultivators belonging to the village received water from the scheme. The scheme was under the jurisdiction of the Block Development Officer and managed by a seven-member committee. In 2016, the scheme suffered from lack of maintenance and institutional corruption. Changes in forms of irrigation led to changes in contracts. In 2005, share contracts prevailed in the water market. Electrification changed contracts in the private water market, with share contracts giving way to fixed water rates. It can be argued that concentration in the ownership of tubewells speeded up the change to fixed rates, as share contracts required a few sellers to maintain many records and keep track of cultivation, a difficult and complex task. At the time of the 2010 survey, all water charges were paid in fixed rates, in cash or in kind. Payments in kind were made after the harvest. The value of payment in kind per acre was about 15 per cent higher than payment in cash, suggesting an interest payment. In contrast, for the cooperative tubewell, crop-acreage contracts were paid in cash. The contracts for sale of water were decided democratically. Irrigation costs differed significantly between the private water market and the public cooperative tubewell. In 2005, the cost of irrigation for diesel-powered shallow tubewells amounted to 40 per cent of the gross value of output for boro paddy, which was the major irrigated crop. After electrification, the cost of irrigation fell. In 2010, the average cost of irrigation for boro rice in the private water market was Rs 5,678 per acre for diesel pumps and Rs 3,994 per acre for electric pumps. In contrast, water charges for the cooperative tubewell for boro rice were less than 50 per cent (Rs 1,883 per acre) of what was charged in the private water market. The ratio of the cost of irrigation to GVO for irrigated crops was also much lower for households that received water from the cooperative tubewell than for households that purchased water from private electric and diesel-powered tubewells. Between 2010 and 2015, the share of irrigation cost in total paid-out costs declined for households that received water from the cooperative tubewell, while it remained the same for households that purchased water from private tubewells. However, by 2015, users of private tubewells had higher yields than households using the cooperative tubewell for boro rice cultivation. The ratio of the cost of irrigation to GVO remained much lower for users of the cooperative tubewell than for users of private tubewells, as water charges for the cooperative tubewell for boro rice were much lower than for private tubewells. In conclusion, there were changes in irrigation in Amarsinghi between 2005 and 2015. First, electricity for irrigation came to the village in 2007, and led to a shift from diesel-powered to electric-powered tubewells. But the high capital cost of tubewell installation and hurdles in obtaining permission for tubewell installation limited the ownership of tubewells to a few persons. Secondly, the government installed a deep tubewell run by a cooperative in 2008. These two state interventions, electrification and the installation of a tubewell by the government, substantially reduced the costs of irrigation for the major irrigated crops. The existence of a cooperatively managed tubewell may have played a role in checking price rise in the private water market. Acknowledgements: An earlier version of this note was presented at the 76th Annual Conference of the Indian Society of Agricultural Economics, Jorhat, Assam, November 21–23, 2016. We are grateful to the participants for their comments and suggestions. We are thankful to the Foundation for Agrarian Studies for providing us access to its village studies data. We are also grateful to Madhura Swaminathan and the research team at the Foundation for Agrarian Studies for their comments and suggestions. Their feedback has helped in shaping the note in its present form. 1 Small farmer households are households with operational holdings between 1 and 2 hectares. Marginal farmers are households that have operational holdings of less than 1 hectare of land. 2 See http://fas.org.in/category/research/project-on-agrarian-relations-in-india-pari/ for a description of the Project on Agrarian Relations in India (PARI), the surveys, and the study village. 3 Semi-structured interviews were conducted with water sellers, water buyers, members of the cooperative that controlled the cooperative tubewell, and elected representatives from the village, to understand the historical trajectory of the development of irrigation and forms of water exchange. 4 The village is in the Gangetic allluvial region where farmers can easily gain access to groundwater throughout the year. 5 The former upa-pradhan (deputy head) of the panchayat reported in an interview on August 11, 2016 that the panchayat had initiated the process of granting permission for installing private diesel-powered shallow pumps. 6 Farmers had to dig to an extent of seven to 10 feet near the shallow tubewell and push the pump down to reach the water level during summer months. This was extremely laborious work. 7 AM, a cultivator, reported in an interview on August 12, 2016 that water buyers had to bear the total cost of diesel used for irrigation. To buy diesel for boro cultivation irrigation, water buyers sold mustard, which would otherwise have been used for their annual domestic supply of mustard oil. In addition, the supply of diesel was very low in nearby towns. Farmers had to queue up for long hours to buy diesel during boro cultivation, as demand was very high. 8 Some authors have written that bureaucratic hurdles in the way of getting permission and corruption in tubewell installation were the major reasons for the decline in the growth rate of tubewell irrigation in West Bengal after the 1990s (Mukherji et al. 2012). An interview with AD, a cultivator, on August 11, 2016 shows how the experience of obtaining permission for an electricity connection for a tubewell can be an unpleasant one. AD installed an electric submersible pump jointly with another farmer, as the capital cost for installing the submersible tubewell was too high for him to cover alone. A sum of Rs 80,000 was given to a middleman in 2007 for procuring the relevant documents for drilling a tubewell, as per the requirements of the State Water Investigation Directorate (SWID) and Electricity Department. The experience of getting a permanent electric connection has been frustrating for them. The Electricity Department assigned a contractor for the electricity connection, who asked for a bribe. Up to the time of our last fieldwork in 2016, Rs 15,000 had been paid to the contractor, but the work was yet to be finished. The respondent reported that the contractor would want more money to finish the remaining work. The Electricity Department was not willing to take any responsibility as the work had been assigned to a contractor. 9 This tubewell had been inherited and was owned by two brothers. 10 In interviews conducted on August 11–12, 2016, tubewell owners in Amarsinghi reported that a uniform water rate for each crop had been decided among all tubewell owners in Samsi gram panchayat. The rate was fixed in such a way that it would profit water sellers. There was no space for water buyers to decide water rates. But in the discussion with other tubewell owners, it was reported that BM decreased the water rate to increase his command area without any discussion with other tubewell owners. 11 Interview with AD, August 11, 2016. 12 High land requires more frequent water during boro cultivation as compared to low land. 13 In 2007, when electrification was first introduced, tubewell owners received temporary connections for 105 days, particularly for boro rice cultivation. Rs 22,500, a considerable sum, had to be paid to the Electricity Department as advance payment at the beginning of the crop season. By 2015, all electric tubewells were metered and received electricity supply throughout the year, and payment was made according to use. 14 The three time-segments for tariffs in agriculture are: normal hours from 6 am to 5 pm, peak hours from 5 pm to 11 pm, and off-peak hours from 11 pm to 6 am. The objective of this system is to encourage the use of tubewells during off-peak hours. 15 Interview with the secretary of the cooperative society, June 2015. 16 Paid-out cost was calculated using the definition of Cost A2 by the Commission for Agricultural Costs and Prices (CACP). Bakshi, A. (2010), “Rural Household Incomes,” PhD thesis submitted to the Department of Economics, University of Calcutta, Kolkata. Bhatia, B. (1992), “Lush Fields and Parched Throats: Political Economy of Groundwater in Gujarat,” Economic and Political Weekly, vol. 27, no. 52. Bhattacharya, M., and Bhattacharyya, S. (2007), “Agrarian Impasse in West Bengal in the Liberalisation Era,” Economic and Political Weekly, vol. 42, no. 52. Boyce, J. (1987), Agrarian Impasse in Bengal: Agricultural Growth in Bangladesh and West Bengal, 1949–1980, Oxford University Press, New York. Dubash, N. (2002), Tubewell Capitalism: Groundwater Development and Agrarian Change, Oxford University Press, New Delhi. Government of India (1992), All-India Report on Agricultural Census, 1985–86, Department of Agriculture and Cooperation, Ministry of Agriculture, New Delhi, available at http://agcensus.nic.in/document/ac8586/ac8586rep.html, viewed on November 22, 2017. Government of India (1998), All-India Report on Agricultural Census, 1990–91, Department of Agriculture and Cooperation, Ministry of Agriculture, New Delhi, available at http://agcensus.nic.in/document/ac9091/ac9091rep.html, viewed on November 22, 2017. Government of India (2003), All-India Report on Agricultural Census, 1995–96, Department of Agriculture and Cooperation, Ministry of Agriculture, New Delhi, available at http://agcensus.nic.in/document/agcensus9596/agcensusrep9596.htm, viewed on November 22, 2017. Government of India (2008), All-India Report on Agricultural Census, 2000–01, Department of Agriculture and Cooperation, Ministry of Agriculture, New Delhi, available at http://agcensus.nic.in/document/agcenrep01.htm, viewed on November 22, 2017. Government of India (2012), All-India Report on Agricultural Census, 2005–06, Department of Agriculture and Cooperation, Ministry of Agriculture, New Delhi, available at http://agcensus.nic.in/document/ac0506/ac0506rep.html, viewed on November 22, 2017. Government of India (2015), All-India Report on Agricultural Census, 2010–11, Department of Agriculture and Cooperation, Ministry of Agriculture, New Delhi, available at http://agcensus.nic.in/document/ac1011/ac1011rep.html, viewed on November 22, 2017. Janakarajan, S. (1993), “Triadic Exchange Relations: An Illustration from South India,” IDS Bulletin, vol. 24, no. 3, Institute of Development Studies, Brighton. Mukherji, A. (2007), “Implications of Alternative Institutional Arrangements in Groundwater Sharing: Evidence from West Bengal,” Economic and Political Weekly, vol. 42, no. 2. Mukherji, A., Shah, T., and Banerjee, P. (2012), “Kick-starting a Second Green Revolution in West Bengal,” Economic and Political Weekly, vol. 47, no. 18. Ramachandran, V. K., Swaminathan, M., and Bakshi, A. (2010), “Food Security and Crop Diversification: Can West Bengal Achieve Both Simultaneously?” in B. Basu, Bikash K. Chakrabarti, Satya R. Chakravarty, and Kaushik Gangopadhyaya (eds. ), Econophysics and Economics of Games, Social Choices and Quantitative Techniques, Springer-Verlag, Milan. Rawal, V. (2001), “Expansion of Irrigation in West Bengal: Mid-1970s to Mid-1990s,” Economic and Political Weekly, vol. 36, no. 42. Rawal, V. (2002), “Non-Market Interventions in Water-Sharing: Case Studies from West Bengal, India,” Journal of Agrarian Change, vol. 2, no. 4, October. Rawal, V., and Swaminathan, M. (1998), “Changing Trajectories: Agricultural Growth in West Bengal, 1950 to 1996,” Economic and Political Weekly, vol. 33, no. 40. Rogaly, B., Harris-White, B., and Bose, S. (1999), “Introduction: Agricultural Growth and Agrarian Change in West Bengal and Bangladesh,” Sonar Bangla: Agricultural Growth and Agrarian Change in West Bengal and Bangladesh, Sage Publications, New Delhi. Saha, A., and Swaminathan, M. (1994), “Agricultural Growth in West Bengal in the 1980s: A Disaggregation by Districts and Crops,” Economic and Political Weekly, vol. 19, no. 13. Sarkar, A. (2011), “Socio-economic Implications of Depleting Groundwater Resource in Punjab: A Comparative Analysis of Different Irrigation Systems,” Economic and Political Weekly, vol. 46, no. 7. Shah, T. (1991), “Water Markets and Irrigation Development in India,” Indian Journal of Agricultural Economics, vol. 46, no. 3. Shah, T., and Ballabh, V. (1997), “Water Markets in North Bihar: Six Village Studies in Muzaffarpur District,” Economic and Political Weekly, vol. 37, no. 18.